Bill Hybels: Willow Creek Community Church Senior Pastor; "The Privilege of Leadership"
Bill began the conference in his characteristically candid style with a story about Thanksgiving Day dinner and his (failed) attempt to effectively grill a turkey for his family. He then went on to speak on Luke 8: the parable of spreading seed on varying qualities of soil. When the seed catches on good soil, it = transformation of a human heart. To Bill, this is the meaning of life: "Everyone’s life would be better if God were at the center of it.” Bill says that the fact that anyone rejects the gospel (as "rocky" soil), is encouragement for the church to plant more seed. On leadership, Bill said that energy is the #1 quality leaders need to have/foster: not only high levels of personal energy, but also an ability to energize others. To make success more tangible, Hybels introduced a "6x6" rule to leaders, meaning they should pick six tasks at a time to focus on, accomplishing them with bursts of energy and concentrated focus that produce high production. Leaders' main goals should be moving people to action, to encourage people to move from a current unacceptable reality to some preferred future. He also said to be wary when you reach the middle stages of carrying out the vision: that's when most energy is lost, but also the most important place to sustain it. 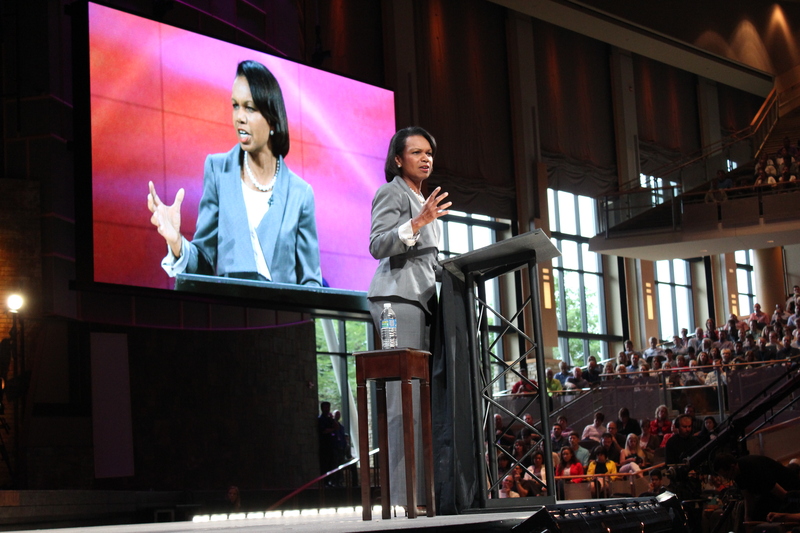 Condoleezza Rice: Former U.S. Secretary of State: "No Higher Honor"
"For Christians, all people are all equals before the law, and also before God - Jesus died for each and every one of us, no matter our circumstances of life or depth of our sin - He died for each and every one of us." "Delivering compassion to an AIDS orphan has to be work of people who believe every life is worthy. So too, delivering hope and shelter to a woman who has been trafficked in SE Asia or Europe to a brothel where she will have no hope and no future. One person who will reach out and lift her up is doing the work of compassion; the work intended for Christians to do. "It's important to extend compassion, but the best thing to do for a person is give them control of their own future and that is the opportunity to be educated." "Out of struggle very often comes victory – this is the central message of our Christian faith. After Friday, there will be Sunday." "The X factor that separates an exceptional leader from an average leader is not personality – it’s humility combined with will." "The true signature of mediocrity is chronic inconsistency. " “Productive Paranoia: the only mistakes you can learn from are the ones you survive. You have to be optimistic if you’re trying to go to the South Pole or build an airline, but it's also important to be aware that the world is scary." "The marriage of creativity and discipline is key to leadership success." Read a powerful, detailed blog post on her talk at the Summit here: "Carly Fiorina at the Leadership Summit (or, when the former CEO of HP Made Me Cry)"
"The moral challenge of this century is gender inequity - it's the fact that so many girls are forgotten, dropping out of school because of gender. In China, it's not your IQ - it's your chromosomes that determine your success." "Girls don't just get kidnapped and trafficked abroad - it happens in U.S. cities too." "There are very few things in life that can actually change your level of happiness / elevate your set point for happiness. One of those things is contributing to a cause larger than yourself." "With great fortune comes great responsibility-if we want a better world we have to help make it a better world." Addressed the "generation gap:" "There’s some misunderstanding and missed opportunities between generations today, both in the corporate world, and in our ministries." "Don’t resent, fear or judge the next generation: believe in them, because they need you. God values maturity, and if you’re not dead, you’re not done." "Don't delegate tasks - then, you just create followers. Instead, delegate authority: it's then we create leaders." "Don’t try to be something you’re not – be yourself. Authenticity trumps cool every single time." "Respect is earned, but honor is given. Show honor to those who are above you - if you want to be over, learn to be under with integrity." Create ongoing feedback loops with those who are both older and younger.